Choose Flat File & Blueprint Storage: Purchase Now! Storing extra-large drawings and documents is a snap with our selection of specially-designed blueprint storage. How can you store blueprints? 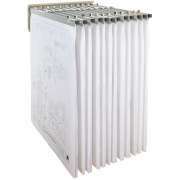 They can be organized and stored vertically on a rolling stand or wall-mounted rack. Whether you choose to hang your drafting files or roll them up, all of our blueprint holders provide ready access to the files that you need. Hertz Furniture offers a high-quality selection of flat file storage. Our models are designed to protect your drawings so they will stay in great shape through many consultations and planning sessions. Why do I need special blueprint storage? Whether you need storage for a professional or educational setting, having equipment that protects and organizes drawings is very important. Students and employees spend many hours drafting blueprints and creating sketches, so you want to make sure that their hard work won&apos;t be accidentally destroyed or damaged. If large papers are left out or stored in improper places, the risk of accidental spills and tears damaging work is quite high, even when people are trying to be careful. That is why flat file storage is great to have. Once you have determined that you need a proper place for drawings, there are two main options to choose from. 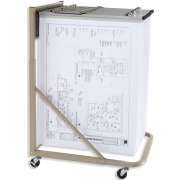 Large papers can be stored on wall-mounted blueprint racks or mobile carts. The ideal configuration will depend on how much space you have in the drawing room as well as whether you will be transporting drawings. What are the benefits of blueprint racks? Wall-mounted racks save floor space and keep everything where you need it. This arrangement is ideal for a number of people who are working together and using a common storage space. When everything is organized in one blueprint storage space, it is less likely that plans will get moved around and misplaced. There is no need to scramble around and track down works in progress because they will always be returned neatly to the common blueprint racks. Blueprint holders from Brookside Design are arranged for easy access and secure storage. They allow you to clamp a large quantity of drawings securely into place. The racks remain in a compact, side-to-side configuration until it&apos;s time to remove something. When you need to retrieve drawings for a client meeting or brainstorming session, pivot hangers swing open for easy access, so you can quickly find what you are looking for. What is the best way to move blueprints around? If you know that you will often need to move drawings around, a blueprint organizer can really come in handy. Carts can be rolled from place to place and you don&apos;t have to remove or carry their contents. With this arrangement, you don&apos;t need to risk drawings being damaged in transit. When you have to carry drawings, it is more likely that they will get ripped or marked up. Blueprint carts are good for a big company where you might need to bring a large number of projects in progress to another part of the building for planning meetings. Where can I store rolled-up blueprints? 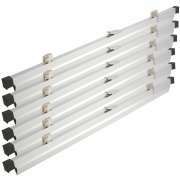 An alternative to the vertical hanging file arrangement is a roll file from Adir Corporation. 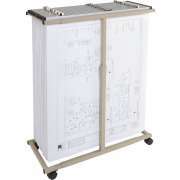 This mobile blueprint storage cart can hold rolled up maps, blueprints and drawings. The tiered design enables you to view contents easily without having to lift up or move anything. This convenient unit is available in a selection of colors. It saves time and eliminates unnecessary handling. A high-capacity cart is great if you need to move multiple documents, blueprints or pictures at the same time. However, if you just need to bring one or two things to particular meeting, such a large item is unnecessary. Transport tubes are always great to have around for those times when you just want a few pages, and you need to make sure that they won&apos;t get damaged in transit. Flat file cabinets are a good option if you want to keep everything neatly stowed in one convenient place. At Hertz Furniture, we understand that drafting blueprints and drawings takes a considerable amount of time, patience and energy. Having a secure place to store them ensures that hard work will pay off and stay in great condition. If you need help deciding which clamps are the best size for your drawings or what your ideal arrangement is, contact the Hertz Project Solutions team for free project-planning advice.